Uncut Sheet of (4) Friedberg 270 (W-801). 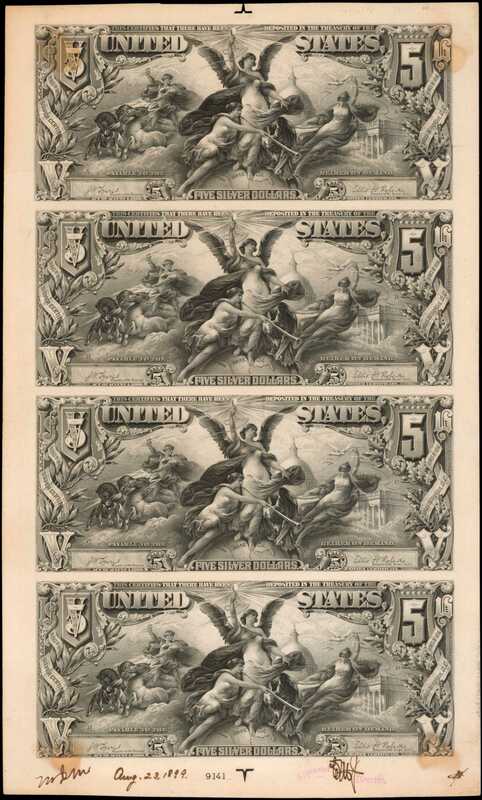 1896 $5 Silver Certificates. PMG About Uncirculated 50 Net. Approval Sheet Face Proofs.Hessler-360. Black on India paper, mounted on original wide margined card. Signatures of Lyons-Roberts. Plate positions A-B-C-D. Uncut sheet of final proofs, with signatures and plate position letters, of the black and white portions. Central vignette, Electricity Presenting Light to the World. Bottom margin with engraved plate number 9141. Two unidentified handwritten initials in brown ink are noted in the bottom margin, as is the date August 23, 1899. Type of Fr. 270. Unique, the only proof sheet of Educational series notes of any denomination. An amazing federal proof item that was last sold in our 2011 sale as part of the Bass Collection for $31,325 and less recently in 1990 at Memphis. One of the treasures from the Glenn Jackson collection where it brought $9,350 in a less than vigorous economy. Once mounted from the card, verso with some remnants. That glue has foxed the four corners a bit and there are two horizontal card folds noted. The overall effect though is magnificent. A key piece with this signature combination and final plate position letters added. Emitted notes of the type were printed from this plate. PMG mentions "Stained From Being Previously Mounted" in the comments section of the holder.<p>The signatures are those of Judson W. Lyons, Register of the Treasury, and Ellis H. Roberts, Treasurer of the United States. The combined tenure of these officials lasted from April 7, 1898 to June 30, 1905, and this signature combination is the last of three found on this series of banknotes. The date on this proof sheet, August 23, 1899, probably indicates roughly the date of the earliest printings of notes with this signature combination. As stated, this is the only known proof sheet of the Educational series.<p>By any measure this has to be one of the most spectacular federal bank note items offered in the present century. No amount of money could secure a duplicate.From our Harry W. Bass, Jr. Collection Sale, Part V, August 17, 2011, lot 5031; Dr. Glenn Jackson Collection, Nascas (a division of R.M. Smythe) sale of June 16, 1990, lot 3245.